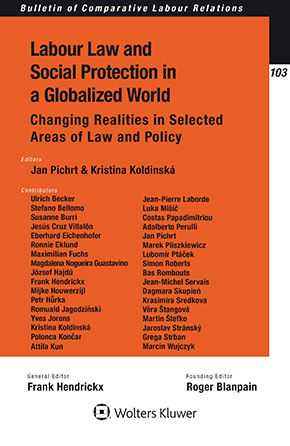 Labour Law and Social Protection in a Globalized World covers burning issues and current reflections on labour and social security law from European as well as comparative perspectives. The protection of jobs and labour law standards achieved by employees in the past has been under pressure from neoliberalization forces for many years. The changing realities need to be studied from a legal point of view as new realities confront labour law structures with new developments on the labour market in public policy as well in industrial relations. In light of these recent trends, the focused perspectives evident in this original collection of essays go a long way towards clearly defining where labour law and social security law must set their sights in order to preserve fair and productive employer-employee relations in the new world of work. This book contains chapters which are the papers submitted to the XII European Congress of the International Society for Labour and Social Security Law (ISLSSL) held in Prague, September 2017. One aspect that is covered in these chapters is the current challenges to social security that are brought by migration as an intensified phenomenon in Europe of today. Furthermore the concept of harmonizing family and working lives is discussed from the perspective of ongoing amendments of the EU legislation. Throughout this book, the changing role of the state and reform agendas is emphasized which helps readers stay updated with the current trends in this legislation. Although the focus is on the labour law in Europe, there is an abundance of comparative detail, allowing for global application. As a matchless, up-to-date overview and analysis of how new and emerging forms of employment and industrial relations impact employee security, this book serves as a guide to practitioners, academics, and policymakers concerned with ensuring the persistence of fair and viable standards in labour and social security law. Chapter 2 Crisis and Labour Reforms in Spain: A Paradigm Shift? Chapter 11 Temporary Agency Work Directive: As Hollow as Swiss Cheese? Chapter 12 Promoting or Controlling Cross-Border Temporary Agency Work? Chapter 17 A Professional Sportsman: An Independent Worker? Chapter 23 Migrant Workers and European Social Law: Of a Respectable Age or Time for a Rebirth? Chapter 26 Social Integration of Migrants under European Social Charter: Right or Duty?